The ‘Central Abode’ has all the roots of the RISE campuses. It is the place form where Mr. I.C. Rangamannar the Chairman and Mr. T. Venkata Subbaiah the Secretary & Correspondent of the RISE Group of Institutions discharge their fatherly responsibilities for the comprehensive development of the students, professors, the campuses and the RISE parents. The RISE Management is rich in its vision and mission. The Chairman and the Secretary & Correspondent are the personalities with creative outlook and no-compromise attitude. They do provide the best to all those in the campuses. Though they hail from the business background, they are rich with the philosophy of education and enthusiastic. The two big - hearted friends in the RISE Management are toiling for making the RISE campuses a true spot of excellence in the realm of professional education. Dr. K.V. Narasimha Rao, Ph.D., F.I.E. Dr K. V. Narasimha Rao is a Ph.D. from the Indian Institute of Science (I.I.Sc. ), Bangalore. He received B.Tech. from REC, Warangal and M.Tech. from I.I.Sc., Bangalore. He has 20 rich years of experience in Academics, Administration, Consultancy, Industry and Training and worked at various levels of Management. Dr K.V.Narasimha Rao has several publications in his credit both at the National and International Levels. 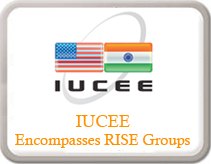 He attended several seminars, conferences at International levels and worked as committee member in various Professional Bodies like IIT Madras, Indian Society for Technical Education (ISTE), Indian Society for Heat and Mass Transfer (ISHMT), American Society of Heating, Refrigeration and Air-Conditioning Engineers Inc, (ASHRAE), Solar Energy Society of India. He dedicated himself to transform students into Complete Professionals. Dr. Y. Jagannadha Rao, Ph.D., F.I.E. Dr Y. Jagannadha Rao is a Ph.D. from Indian Institute of Science (I.I.Sc. ), Bangalore. He received B.Tech. in Chemical Engineering from Andhra University, Visakhapatnam and M.Tech. from I.I.Sc., Bangalore. He has total 40 great years of experience in Academics, Administration, Consultancy, Industry and Training and worked at various levels of management. Dr Y. Jagannadha Rao’s scholarship is seen in his writings published in various national and international journals. He attended many seminars and conferences and he is considered as a dependable and worthy academician. He worked as committee member in various professional bodies like Indian Society for Technical Education (ISTE), Indian Institute of Chemical Engineering (IICHE), Catalyst Society of India, IWRS, and SMFP. Dr. Y. Jagannadha Rao has been honored with various awards. He was listed in Marquis Who’s Who in Science & Technology, 2002-03 and was listed in Marquis Who’s Who in Asia, 2007-08. He was a Recipient of the Best Academician award.